House of Representatives speaker, Nancy Pelosi who sat behind Trump during his 82-minute State of the Union Address on Wednesday has gone viral with her expressions during the speech. But the one that is being hailed on Twitter is her pointed 'sarcastic' clapping when Trump spoke about compromise and the need to 'reject the politics of revenge, resistance, and retribution." Her mocking clap has been the most widely shared moment following the address. 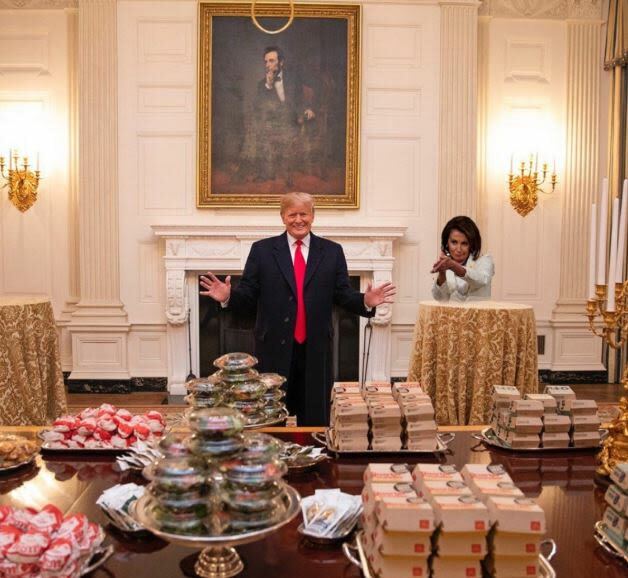 And of course, within seconds, the mems were flying thick and fast....with the image of Pelsui's withering stare and clap photoshopped into every image from Trump handing our 'hamberders' to the football team at the White House to him shaking the hand of North Korean leader KimJong-un.